Home » Category archives "Miscellaneous"
Dachshunds (also known as “wiener dogs”) are known for their long body, short legs, and floppy ears. While these adorable dogs make great household companions, their unusual proportions can make them delicate — their long spines are especially sensitive. This means that extra care must be taken to support the dog’s back as you pick it up, hold it, and set it back down. Place one hand under the chest. Picking up a dachshund is different than the way you’d pick up other breeds, but it’s not especially hard once you learn the right method. Start by slipping a hand under the dog’s upper body to support his chest and ribcage. Don’t lift up yet. Spread your fingers out so that you support as much of the dog’s upper body as possible. The wider the area you can spread his weight over, the gentler it will be on his spine. Place your other hand under the dog’s rump. Gently slip your free hand under the dog’s rump — either directly behind it or just in front of the dog’s rear legs to support its lower body. Get ready to lift up. Here, again, it is best to spread your hand to give the widest base of support possible. Slowly lift the dachshund, keeping its body level. Now, simply lift the dog up. As you go, try to keep the dog’s lower body from hanging or drooping beneath its lower body. A little bending is fine, but you’ll want to keep the dog’s back as flat as possible to keep from putting stress on it. Continue to support the dog’s back as you hold it. 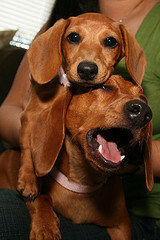 As you move around or play with your dachshund, make sure its lower back is well-supported at all times. Dachshunds aren’t like other dogs — letting their lower bodies dangle is uncomfortable to them and can contribute to painful back problems (like slipped and ruptured discs) over time. Luckily, with a little practice, this should become second nature after a while. Eventually, it will feel “wrong” to pick the dachshund up in the incorrect way. Gently shift the dog’s weight so that it comes to rest on the forearm of the arm that you were using to support its rump. Use your full forearm to support its weight. Tuck the dog against your body for added support and comfort. This should feel a little like how you would cradle a baby or hold a football. Use your free arm when needed to help the dog balance and keep it from squirming or wriggling free. To set the dachshund down, slowly lower it to the floor. If you’ve had experience with other dog breeds, you may be used to “dropping” or gently heaving them back to the ground when you’re done holding them. With dachshunds, instead, you’ll want to lower the dog all the way to the ground before letting go. As always, keep its back well-supported as you lower it down. Ideally, you’ll want its feet to be touching the ground before you let go. As you’ll read below, even a drop of a few inches can put stress on the dachshund’s back and joints. Don’t pick up a dachshund by his upper body. Many are accustomed to picking up dogs as if they were human babies by putting one hand under each of the dog’s “armpits.” However, this is unsafe for dachshunds. This puts an unnatural stress on the dog’s back — its spine simply isn’t built to support its long body without any other support. In general, you will want to avoid any sort of hold that supports only half of the dog’s body length. This is true even if the dog is already standing on one set of legs — like, for instance, if he is propping himself up on his hind legs while looking over the top of a sofa. In this case, you’ll want to lean down so that you can support his rump before picking him up. Never drop the dachshund back onto the ground. As noted above, dogs should be set down gently, not dropped. A dachshund’s legs are very short compared to other dog breeds’. This means that they can’t bend very far to absorb the shock of hitting the ground, which puts most of the impact stress on the leg joints and back. Getting rid of the dog’s “fall” eliminates this danger. Don’t trust your dog’s body language here. Dachshunds don’t know that their skeleton can’t support falls, so they may be perfectly willing to jump out of your hands. Even if this doesn’t cause them immediate pain, it can lead to painful problems if continued in the long term. Never make a dachshund bend or twist when you pick him up. Dachshunds’ long, slender spines are especially vulnerable to injury, which is why it’s so important to keep their bodies straight when you pick them up. You will definitely want to avoid any activities that put a twist or bend in the dog’s back, as this increases the stress on it and can contribute to conditions like slipped discs. For example, one way you might accidentally do this is by scooping the dachshund up suddenly when it doesn’t expect it. If you startle your dog, it may wriggle or twist out of one of your hands, putting an unnatural bend in its spine as it hangs. Make sure your dog is calm and aware of you before you attempt to pick it up. Don’t ignore any signs of distress from the dog. Dachshunds, like all dogs, are generally pretty smart about letting you know when they are in pain. If your dog looks or sounds uncomfortable when you pick it up, it probably is, so set it back down and re-evaluate the way you’re holding it before you try again. Show family and friends how to hold dachshunds properly before letting them play. Nothing’s more frustrating than when you take the time to learn how to hold your dachshund properly, only for well-meaning relatives to come over and treat it like an ordinary dog. To avoid problems, be sure to educate any visitors about the proper ways to hold your dog before they play with it. This is especially true for children, who can sometimes be too rough with dogs by accident. It’s a wise idea to supervise children when they first interact with your dachshund until you’re confident that they know how to play safely. Dachshunds, Every Place You Look! I was looking around on the web when I can across this web site. It says it have The Worlds Best Photo’s of Dachshunds. I took a lot at the site. There is some cute photo’s so I thought I would share them with you. I hope you enjoy them as much as I do. Anyone who know me, knows that I’m a big beer fan. I suppose it’s only natural — I love German dogs, why shouldn’t I love German beverages? Turns out I’m not the only one. Back in the Milwaukee there’s an actual brewery named 3 Dachshunds Beer Co.! I don’t get to Wisconsin much, but if anyone else does, make sure to drop by there and tell me what it’s like.